Club Penguin Cheats by Mimo777 Club Penguin Cheats by Mimo777: Club Penguin Herbert P. Bear Memory Reviewed By You! Club Penguin Herbert P. Bear Memory Reviewed By You! My favourite moment with Herbert was when the EPF was born. It is very more secret and more high tech than PSA. I was a part of both forces and enjoyed defeating and ruining Herbert P. Bear's plans and being with the EPF helps me realise that Club Penguin is amazing! I Can't wait to see whats in store for the EPF in future. Waddle On CP! 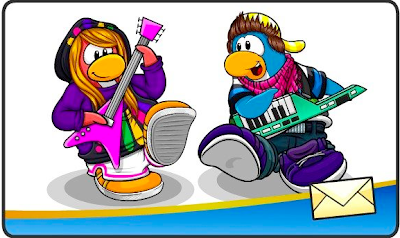 As you know, there is a new Penguin Style Catalog (click here for the cheats) with rockin' styles for the Music Jam, so for next week's Reviewed by You, Club Penguin wants to know what your favorite musical instrument is and what you like best about it? I'd have to say I like the didjeridu best! How 'bout you? Hey i know its off topic but i found a glitch go to a igloo on the map and then go to the mine play puffle rescue im not sure if other games work yet but once you finish and its says all about stamps and stuff once you exit that you should go back to the iggy you were in! I know that its cool and more high tech, but I wish that the PSA was still there and only the people who actually BOUGHT the Club Pengin EPF DS game were in the EPF, because they (and me) actually deserved it more. O luv didjiriedoo's too! I do play the piano tho! I know this isn't a cheat or anything, but my favorite party of the year is the music jam, mostly because I'm a music nerd. Anybody know the movie "School of Rock?" Yeah, fave movie of all time!! mimo im pretty sure it meant what your favorite instrument on club penguin was not in real life.i would have to say mine is the guitar. and GH Daniel PSA was destroyed so they could make EPF so why would PSA still be there? AAAAAH! I went on Club Penguin, Mine Shack, And it was blank!!!!!!!!! It wasn't just me! What happened? !